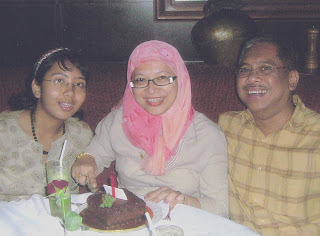 Mum's birthday fell on 11th of Jan (Thurs) but since the whole family was crazy busy this week, with me busy with school homework, dad busy with his work and the birthday girl itself was busy with her uni's theatre week, we didn't celebrate on the exact day. Instead we celebrated my mum's birthday today at a Swiss cuisine restaurant, Chalet in Equatorial Hotel. I ordered beef tenderloin (a total yummy!) while my parents ordered Swiss cod or something like that. While we had our desserts, (mine: apple tart) the string quartets played a b'day song for my mum and serenaded our table with a Beatle's song, Yesterday. The staff even gave a free birthday cake! I could see that her face glowed with happiness with all the treats and celebrations she had gotten. It warmed my heart to see her so happy on her special day after a whole week of stress and hardwork due to her job. Thanks for sharing the evening with me and your Dad.I see that you "tompang semulut".Ha ha.